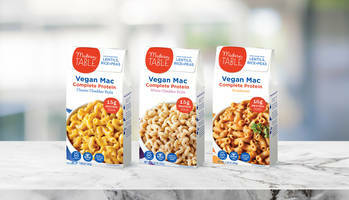 Modern Table®, maker of delicious, complete protein pastas and Mac & Cheese, is excited to unveil its first-of-a-kind complete protein Vegan Mac line in three mouthwatering flavors - Southwest, Classic Cheddar Style and White Cheddar Style - which will be available nationally at Whole Foods Market. While Vegan Mac & Cheese is not new, Modern Table is the first to offer a complete protein Vegan Mac with its pasta made from a unique blend of lentils, rice and peas delivering all nine essential amino acids for long-lasting energy, good digestion and improved muscle health. Modern Table pasta is a clean, nutritious alternative to traditional wheat pastas and is GMO-free, vegan and gluten-free. Combined with Modern Table’s newly developed dairy-free cheese sauces, all three flavors pack up to 16g of protein per 3.5oz serving and deliver the gooey, cheesy mouthfuls one expects from Mac & Cheese. Combining the power of complete plant protein with the joy of comfort food, all three new Vegan Mac flavors serve two people and will be available nationally at Whole Foods Market in February - each for $3.49-$3.99 MSRP. For more information please visit http://www.moderntable.com. At Modern Table, our mission is to make everyday foods work harder for you with the power of complete protein. We believe meals should always be delicious and nutritious, which is why our pastas are made with lentils, rice and peas, containing all nine of the essential amino acids your body needs. And because it’s plant-based, you avoid things like the cholesterol or saturated fat found in animal protein sources. Whether you’re a busy body or a body in training, we know you’ll the convergence of good health, delicious flavor and unparalleled convenience. All Modern Table products are GMO-free, gluten-free and soy-free with no artificial preservatives or colors and are available online at http://www.moderntable.com and nationally at Whole Foods, Wegmans, Safeway, Amazon and more.